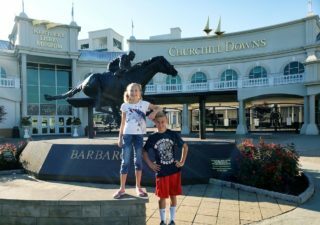 The Kentucky Derby Museum Golf Cart Tour is a fun way to see and learn about Churchill Downs. Writers were hosted for purpose of review. Have you ever wished you could go “beyond” the track at Churchill? See the horses up close in their stables? Understand how the backside operations run every day? 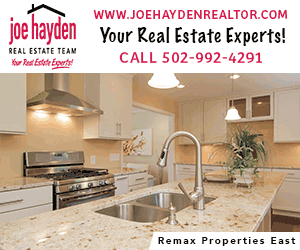 See where the trainers, grounds crew, jockeys and many others live and work? Maybe you’ve visited the Kentucky Derby Museum before, but have you ever taken one of the many tours they have to offer? 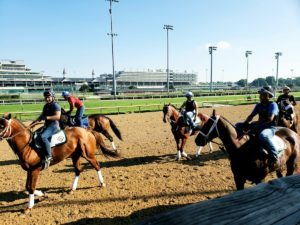 If the answer to that is No, and you, your family, or out-of-town guests are interested in seeing and learning much more about Churchill Downs, a tour is definitely a must!!! Recently, a few of us (2 adults and 4 children), got a chance to experience one of the museum’s tours, the Around The Track Golf Cart Tour. For this particular tour, we met at 8 am inside the museum’s front entrance, signed in, and were greeted by our tour guide, who then lead us out the doors to our golf cart. Once boarded, we began our journey ALL around Churchill Downs. And yes, I do mean ALL … The Paddock, through the tunnels, to the backside to see the barns and stables (where we were able to watch many horses, trainers, and jockeys in their daily morning routines/workouts right on the track) then to the grandstand for some history and beautiful views from up top. Lastly, we enjoyed lunch and had plenty of time to enjoy the 2-floors of the Kentucky Derby Museum. The tour lasted a total of 4hrs. In addition to the Golf Cart Tour, there are several other tours to choose from at The Kentucky Derby Museum. The tours differ in what you see, mode of transportation (walking, driving, combinations), length and price. Depending on what you’re looking for, there is a tour to match everyone’s needs. **Be sure to read all information on the website prior to booking, as there are age/height restrictions for certain tours, and other specifics. The Around the Track Golf Cart Tour we took is designated for ages 10 and up. For more fun places to take visitors, check out our TOP 10 Lists!